Fatemah Farhadi was born in a small village in Persia on May 5, 1918 to Arman and Delara Farhadi. Arman was a farmer, and Delara cared for their only child, Fatemah. Fatemah attended high school and then got a job as a seamstress. When she was twenty-one, her father arranged for her to marry her cousin, Saam, who worked as a clerk. Not much is known about their marriage. Their first child, Sara, died when she was just two years old. Several years after that, they had a son, Roshan. After attending high school, Roshan decided to immigrate to the United States, where he made his way to Chicago and married a woman by the name of Pamela Lloyd. 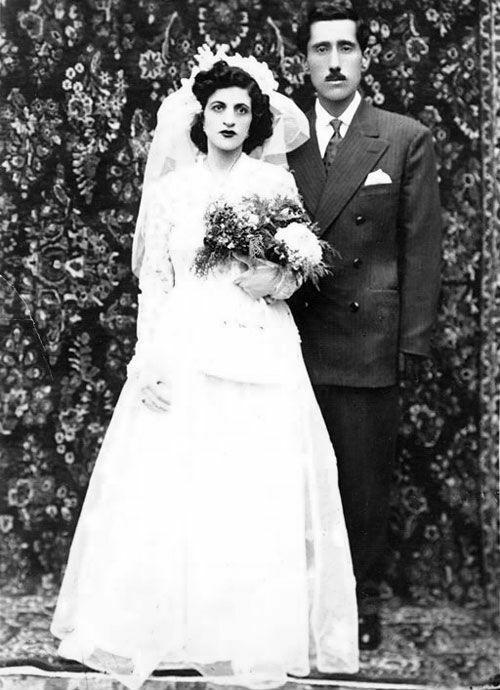 When Fatemah’s husband, Saam, passed away in the 1960’s, she decided that she would also go to America to be near Roshan and persuaded a great aunt to come with her. Fatemah and her aunt lived together in an apartment on Lunt, and Fatemah got a job as a seamstress. Later, she worked for Montgomery Ward in the catalog department. Her great aunt died after only a few years of being here, but Fatemah continued to live in the apartment on her own. She often spent time with Roshan and Pamela and their two children, David and Miriam, but she and Roshan had an “on again, off again” type of relationship. Roshan suffered from substance abuse and eventually died young at age forty-nine. According to David, Fatemah’s grandson, his grandmother has always been very much “a loner.” He says that she rarely visited them, especially after Roshan died, and does not have many friends. She was always quiet and preferred her own company, David says, and has never seemed completely happy. As far as he knows, she does not, or never has had, any hobbies. He says that Iranian people of that generation did not have hobbies or do things for “entertainment,” such as go to the movies or travel. “They went to work and came home to their families, that was all,” he adds. In the early 1990s, Fatemah was hospitalized with pneumonia, and it was suggested by her doctor that she not go back to her apartment and live on her own. The family thought it was wise advice because they had begun to notice that she was getting forgetful. After Roshan passed away, Pamela bought a three-flat on Roscoe and lived in the first floor apartment. David lived on the second floor, and Miriam on the third. So when Fatemah was released from the hospital after her pneumonia, she came to live with the family on Roscoe, bouncing between the apartments, depending on who was home. In 1994, however, Pamela decided to sell the building, and David bought his own building closer to downtown and took Fatemah to live with him. Fatemah has significantly declined in these last two years, however, David says, both mentally and physically. When David would come home from work each day, his grandmother would always report that she had fallen while he was away. David was unsure whether or not to believe her because she never had any injuries and would say things like “the cat helped me up” or something equally strange. Eventually, however, he did witness her fall and took her to the hospital, especially because she had also begun screaming and crying out at night. Upon examining her, the hospital psychiatrist recommended that she be placed in a nursing home. This was an extremely hard decision for David to make, as he says this is not how traditional Iran culture works. However, he admits that the current situation of having her live with him is not good for her either. Never very close to Fatemah, Pamela has no interest in having her mother-in-law live with her at this point and was against her living with David in the first place. Likewise, Miriam is not of much help, having since married and moved to Dubuque, Iowa. Thus, David feels extremely guilty about placing her in a nursing home, but he doesn’t know what to do. Even if she didn’t need help physically, she was becoming increasingly confused at home with him, lapsing into an ancient version of Farsi or abruptly switching from old Farsi to new Farsi, forgetting that David doesn’t understand the older version. He is hoping that she will be able to adjust to life here and that she might actually enjoy it. For her part, however, Fatemah is confused and disoriented. She screams frequently and is often combative. Even when she is relatively calm, she appears worried and anxious. She is able to understand some English, but seems miserable. She does not participate in any activities, but waits for David to visit. When he does come, however, she spends most of the time with him either screaming or crying. Truly a heartbreaking situation and probably more common than we think… the conflict over how to live and how to best help yourself and someone else. Thanks for sharing this, Michelle. Looks like you just did this interview. Thanks for sharing it. Yes, unfortunately, I do think this is a very common situation. Knowing how to balance what’s best for the caregiver and for the loved one in question. Thanks for reading, Diane.